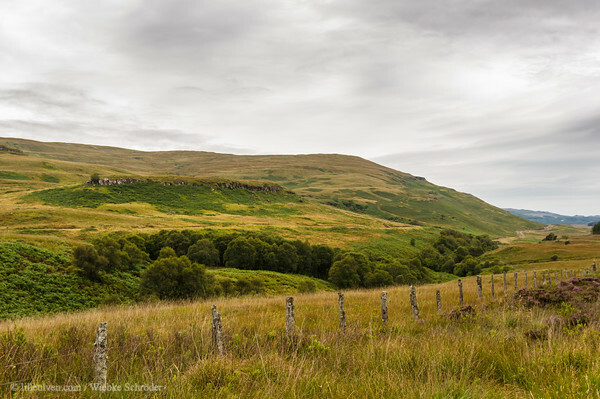 Isle of Mull, Scotland, United Kingdom In the valley between Cnoc nan uan and the fence the Allt Gleann Mhic Caraidh - White Grouse Stream flows. Of Allt Gleann Mhic Caraidh it is said "A mountain stream flowing through Gleann Mhic Caraidh as far as Glen Bellart where it receives the name of River Bellart. The name means Stream of Mc Quarrie's Glen." (Courtesy of Historic Environment Scotland, Ordonance Survey Name Books / Argyll OS Name Books, 1868-1878 / Argyll volume 73 / OS1/2/73/60, uuid="70A37474-6589-488A-9856-368C964D908A" id="United Kingdom lilleulven.com _K3_8097.dng Scotland Lilleulven.com"